Hon. Prime Minister, H.E. Gen. Prayut Chan-O-Cha. Hon. Minister of Natural Resources and Environment, H.E.Gen. Surasak Kanchanarat. 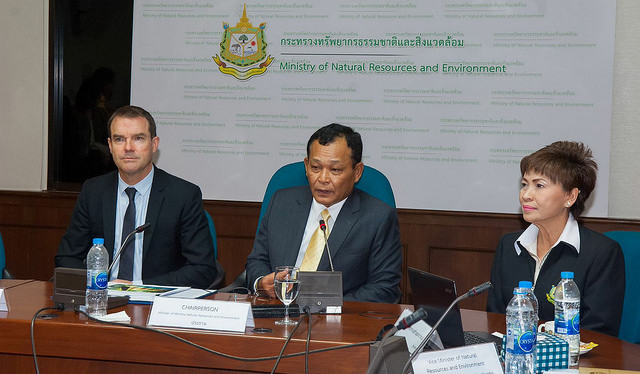 Officers from Departments concerned with Thailand’s National Ivory Action Plan implementation. I would like to express my most sincere thanks to the Government of the Kingdom of Thailand for inviting me to witness the destruction of 2.15 tonnes of confiscated elephant ivory today. I deeply regret that I am unable to make it to Bangkok in person and am most grateful to Ms. Margaret Akullo of UNODC for representing me today. UNODC is a founding partner of the International Consortium on Combatting Wildlife Crime (ICCWC)(an initiative of the CITES Secretariat, INTERPOL, UNODC, the World Bank and World Customs Organization). At the 16th meeting of the Conference of the Parties to CITES held here in Bangkok in March 2013, CITES Parties showed that they were prepared to work together to ensure the survival of the African elephant. They spoke with one voice on the need to take decisive actions to stop the alarming trends in poaching and smuggling. Today’s important event being held in the presence of H.E. the Prime Minister of Thailand serves to raise further local, national and global awareness about the devastating impacts of illegal trade in elephant ivory and the ongoing determination of Thailand and the global community to put an end to it. It comes just one month after the first dedicated UN General Assembly resolution on Tackling illicit trafficking in wildlife was adopted by UN Member States. In 2013 CITES Parties also recognized the need for targeted and time-bound actions to be undertaken along the entire illegal ivory trade chain – from range and transit States to final destination States and markets, and to tackle both supply and demand. This resulted in 19 Parties, including Thailand, being requested to prepare National Ivory Action Plans to strengthen their controls of the trade in ivory and ivory markets, and help combat the illegal trade in ivory. Thailand’s revised Action Plan was submitted to the Secretariat in September last year and the detailed comprehensive progress reports submitted for the CITES Standing Committee earlier this year shows the clear progress made with implementation. This progress includes major legislative reforms. The new Elephant Ivory Act came into force in January along with the parallel amendments to the Wild Animals Reservation and Protection Act. 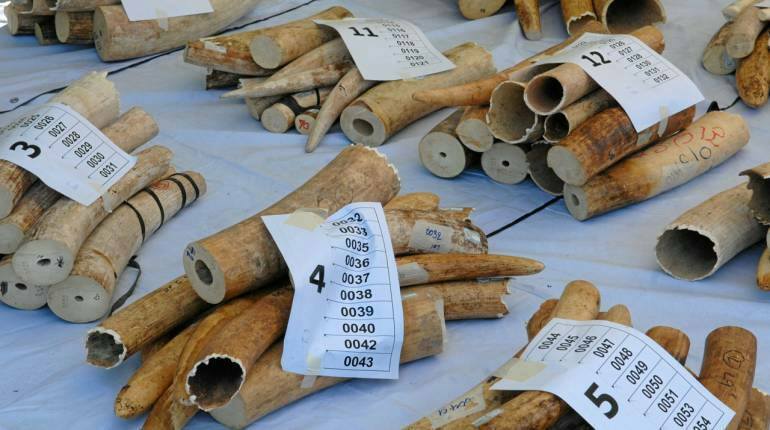 These changes introduced new penalties for the illegal trade or possession of African elephant ivory of up to four years imprisonment, making it a ‘serious crime’ (as defined under the UN Convention Against Transnational Organised Crime). Implementation of Thailand’s new laws and polices is of paramount importance and Thailand has greatly enhanced its on-ground law enforcement efforts to detect and suppress any illegal trade in ivory. This includes establishing dedicated ivory trade patrol teams across the country and special task forces on intelligence and suppression of ivory trade within the Royal Thai Police. These efforts have been accompanied by embarking on the implementation of new registration systems for the possession of ivory and for ivory traders and their stock and comprehensive public education campaigns, including for tour guides. In December last year, I travelled to Bangkok to witness first-hand the wide range of activities that are underway and had the great honour to meet with then Minister of Natural Resources and Environment, senior officers from the Royal Thai Police and senior staff from across 20 government agencies, all of whom are involved in the implementation of Thailand’s Action Plan. It is now critical that this greatly enhanced effort is sustained and Thailand will have the opportunity to further report on its progress to the CITES Standing Committee in January of next year. Distinguished guests, the destruction of confiscated elephant ivory in Bangkok today will not in itself put an end to the illegal trade in elephant ivory. It is, however, ensuring that no one will profit from this contraband and it provides an excellent opportunity to raise public awareness of the legislative reforms in Thailand and the serious penalties that are now in place for illegally trading in African elephant ivory. Today we also raise awareness that modern forensics now allow the age and origin of ivory to be readily identified. This means it is now very easy to distinguish Thai ivory from African ivory, making the identification, prosecution and conviction of those people who seek to launder illegally traded African ivory into the domestic Thai ivory market much more likely. What was recognized by all of the Parties to CITES when we met here in Bangkok at CoP16 is even more relevant today: reversing the disturbing trends in elephant poaching and ivory smuggling requires a sustained and collective international effort and we sincerely thank H. E. the Prime Minister of Thailand for further reinforcing the global community’s collective determination to put an end to elephant poaching and ivory smuggling. 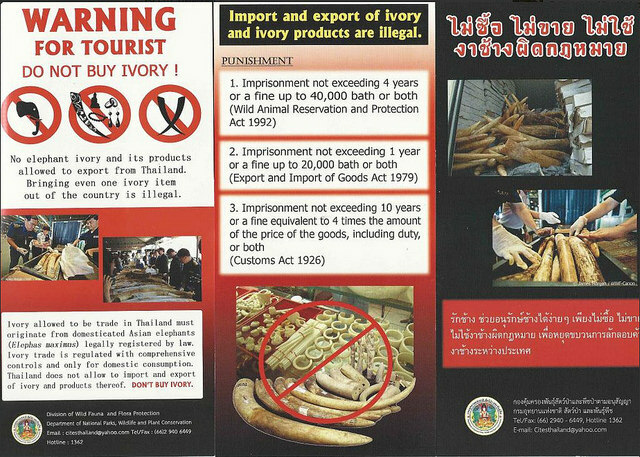 However, when a country, such as Thailand, takes a decision to publicly destroy its confiscated stockpiles of elephant ivory, the Secretary-General regards it as presenting a unique opportunity to draw public attention to the scale, nature and impacts of the serious crimes that lie behind these confiscations and to act as a deterrent to illegal trade. This recognition of wildlife crime as a serious crime gained further momentum thought the recently adopted Doha Declaration at the 2015 UN Congress on Crime Prevention and Criminal Justice and through the adoption of the first UN General Assembly resolution on Tackling illicit wildlife trafficking. Over the past 24 months we have seen the destruction of illegally traded elephant ivory that has been seized and confiscated across the entire illegal trade chain, including in Belgium, Chad, China, the Republic of Congo, Ethiopia, France, Gabon, Hong Kong SAR of China, Kenya, Mozambique, the Philippines, the United Arab Emirates and the United States of America.